This lecture will explore how, when and where the British stereotypes about Russia were formed. Have they been created for hundreds of years or just the last 7 years? What images survived and which were extinguished soon after their emergence? Who can be considered the father of the “Russian bear” – the state propaganda, some secret groups or commercial advertising? The “bear” has been associated as a symbol of Russia at least since the XVIII century, whereas others appeared only about a century ago. The image and the public perception of Russia were closely linked to those goods and products that the Russian Empire was supplying to the British Isles. 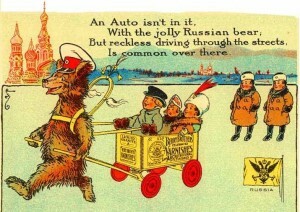 So, actually it was Russian exports that coloured in the bear and put a balalaika and a bottle of vodka into his paws. In this talk Dr Viktor Kulikov will trace the histories of 7 “living” and 7 “extinct” Russian brands, which contributed to shaping the image of Russia over the years. Viktor Kulikov is Senior Lecturer in the Faculty of History at Yaroslavl State University. His earlier research projects were focused on the history of German society in the times of Wilhelm II, and English and German history of the period 1888-1914. His PhD dissertation was on “British public opinion about the German Empire in the time of Kaiser Wilhelm II”. He has undertaken research overseas including at Trinity College, Dublin (2005) and the British Library (2009) and presented his work internationally. His current research is focused on the history of Russian economic and cultural exports in the early years of the 20th century. Kulikov published over 20 scientific articles and one monograph: “German panic. Tevtonofobia in British society 1888-1914” (Немецкая паника. Тевтонофобия в британском обществе 1888-1914). In 2013, he received the fellowship “Russian import in Great Britain in 1907-1914” at the London School of Economic and Political Science. Since 2013 he has been a regular contributor in the “Business of Russia” magazine of the Russian Union of Industrialists and Entrepreneurs. 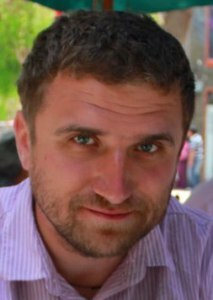 For several years Viktor Kulikov has been working as a history consultant to some leading Russian entrepreneurs. Among his regular clients are: Vagit Alekperov, President of the leading Russian oil company LUKoil; Alexander Shokhin, the head of Russian Union of Industrialists and Entrepreneurs; Gennady Burbulis, the author of Russian Constitution.